Illinoisans of all ages, political party affiliations and regions of the state favor legalizing marijuana and regulating and taxing it like alcohol, as provided in legislation proposed by state Rep. Kelly Cassidy on March 22. 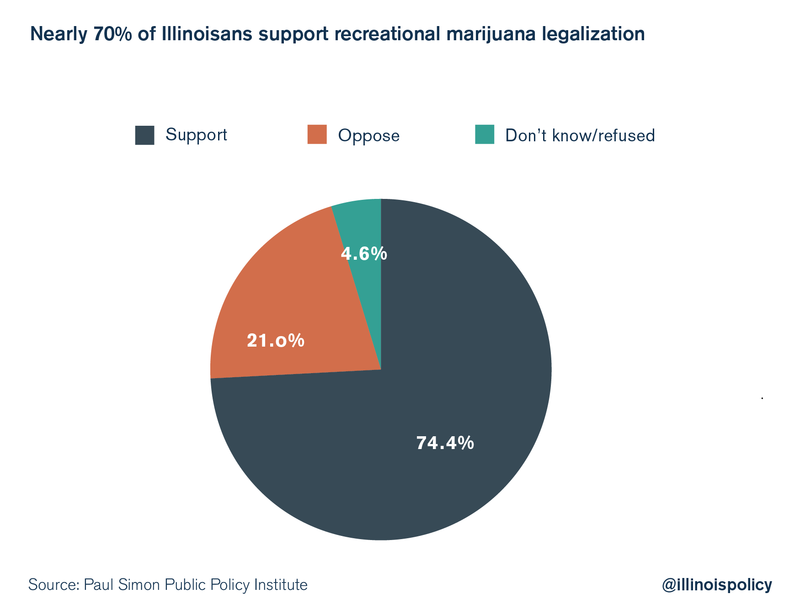 Marijuana legalization in Illinois has support from voters of all ages and regions of the state. Two-thirds of voters support legalizing marijuana for recreational use if it is taxed and regulated like alcohol, according to a poll from the Paul Simon Public Policy Institute at Southern Illinois University Carbondale, released March 27. Support for legalization held among Illinoisans of all ages and from all areas of the state. In the city of Chicago, 74 percent of voters support marijuana legalization. Just outside the city, 70 percent of voters in Cook and the collar counties support legalization as well. And downstate, legalization has support from 54 percent of voters. Support among the youngest poll respondents was strongest, coming in at 83 percent among voters ages 35 or younger. Seventy-seven percent of voters ages 35-50 support legalization, along with 69 percent of voters ages 51-65 years old. Voters ages 66 and older showed the lowest support for legalization, at 51 percent. Cassidy’s proposal would have the state tax marijuana at a rate of $50 per ounce wholesale, and retail sales would be subject to the state’s 6.25 percent sales tax. The Marijuana Policy Project estimates that legalization in Illinois could generate about $350 million to $700 million per year in tax revenue for the state. Marijuana legal for anyone age 21 or older. The substance would be regulated the same as alcohol – buyers must show identification when purchasing, and selling to anyone under age 21 would be illegal. Public smoking would remain illegal, and punishable by a fine of up to $100. Manufacturing and distributing marijuana legal for anyone age 21 or older. But “cultivation” of marijuana plants may not proceed in public view. Growers must also ensure anyone younger than 21 does not have access to the plants, and growers may only grow the plants on property they own legally – or with the consent of the property owner. Anyone who violates these stipulations would face a fine of up to $750. Anyone wishing to grow, process, cultivate, harvest, possess, sell or purchase industrial hemp or industrial hemp-related products would be required to get a state license to do so. A possession limit of 28 grams for state residents. Nonresidents may possess only 14 grams of marijuana. Smoking marijuana while driving still illegal. This legislation would not legalize driving under the influence. Moreover, anyone caught driving while smoking marijuana may be fined up to $200 or have his or her driver’s license suspended for up to six months, or both, for the first violation. People caught for subsequent violations could face a fine of up to $500 and a driver’s license suspension of up to a year. If Cassidy’s amendment passes, the Department of Agriculture would have 180 days to create regulations for cannabis establishments. The legislation has been referred to the Appropriations-Public Safety Committee. Illinois decriminalized small amounts of marijuana in July 2016, when Gov. Bruce Rauner signed legislation making possession of up to 10 grams of marijuana punishable by a fine of between $100 and $200. Prior to this legislation, offenders faced a misdemeanor charge, resulting in a fine of up to $1,500 and possible jail time of up to six months.